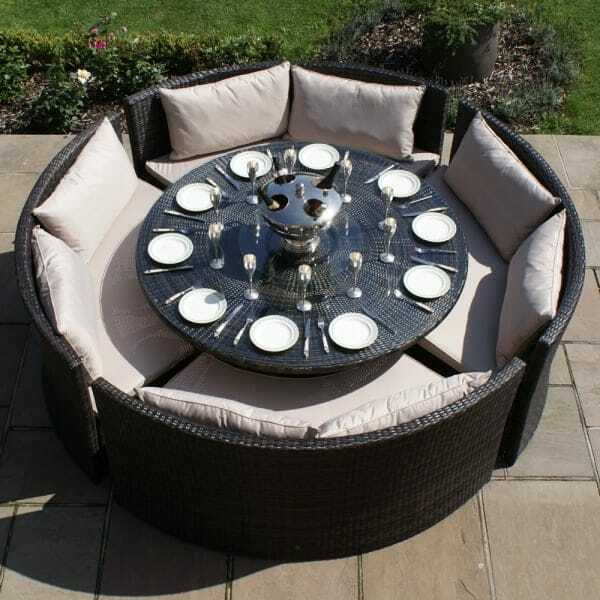 Maze Rattan Dallas Sofa Set: This 8 Person round dining sofa set consists of a large 160cm round table with tempered safety glass and 4 benches which seat 2 people on each and include seat and back cushions. If you are looking for something more unique than a standard round dining set then this Maze Rattan Dallas sofa set is for you. It will be the talking point of friends and family with its stylish and contemporary appearance making it stand out from the rest. This sofa set benefits from a durable aluminium framework that will not rust over time and strong rattan flat weave which can be left outside in all weathers and requires little to no maintenance year after year. This set has been designed with longevity in mind and comes with a 5 year manufacturer’s guarantee for absolute peace of mind. This set will be delivered to you flat packed for easy self-assembly.